These awesome and beautifully printed personalized wall calendars come in a variety of looks and styles, with everything from automotive wall calendars and big rig truck wall calendars to scenic state wall calendars, all printed with your business logo and information. 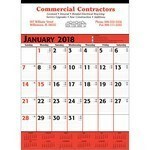 We also offer custom stapled wall calendars, spiral wall calendars and single sheet full year wall calendars that promote your brand all while being functional for the receiver. Organize and plan your events and appointments with this stunning Blue& Black Commercial Planner Wall Calendar. This calendar features 13 individual sheets (December cover sheet free) firmly tinned at the top with loop for hanging. 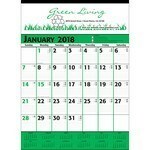 Organize and plan your events and appointments with this stunning Green & Black Commercial Planner Wall Calendar. This calendar features 13 individual sheets (December cover sheet free) firmly tinned at the top with loop for hanging. Organize and plan your events and appointments with this stunning Red& Black Commercial Planner Wall Calendar. 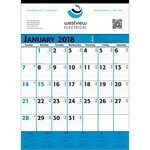 This calendar features 13 individual sheets (December cover sheet free) firmly tinned at the top with loop for hanging.